For more than 20 years, local businesses have formed teams and enjoyed the opportunity of a lifetime — the chance to play at Fenway Park! Corporate teams match up on the historic diamond and support ABCD’s SummerWorks program, which places underserved Boston youth in paying jobs while providing them with dedicated mentoring, career readiness and important life skills. ABCD Field of Dreams is co-chaired by Lew Eisenberg, principal at Cosgrove, Eisenberg & Kiley, P.C. and William Kennedy, partner at Nutter. Each year, this event makes dreams come true for disadvantaged young adults in Boston who are eager to work, learn, and start building a promising future. Over the years, ABCD Field of Dreams has raised over $5 million dollars for our youth programs. ABCD Board Chair Yvonne Jones, President/CEO John J. 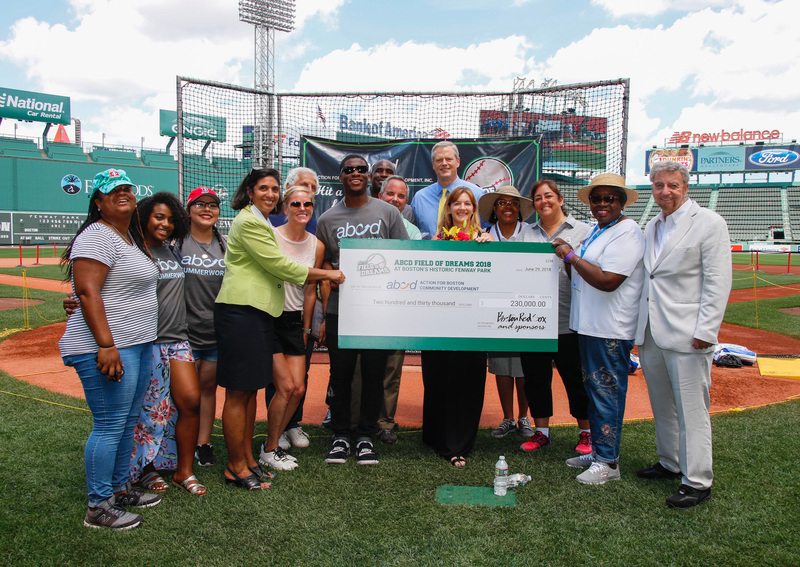 Drew, and EVP/COO Sharon Scott-Chandler thanked our sponsoring teams and welcomed Governor Charlie Baker, Field of Dreams Co-chairs Lew Eisenberg and Joseph Abboud, NBC Sports Boston’s Trenni Kusnierek and Kyle Draper, and ABCD SummerWorks youth to the 2018 Annual Field of Dreams at Fenway Park in Boston, MA. Photo by Chris Aduama. Interested in getting involved? We’re signing up teams and sponsors for 2019 now!